The 2-quart capacity Food Mill is ideal for preparing fresh tomato sauce, applesauce, mashed potatoes, peas or yams. A quick turn of the large crank handle forces food through the blades and directly into a pot or bowl. Made of 18/8 stainless steel. Disassembles for easy cleaning. Includes 3 disks. 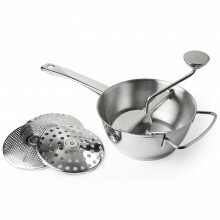 Click the button below to add the Food Mill and Spaetzle Maker to your wish list.